Open 07:00-19:00. This piano is designed by Morganic. wish I could copy it here to share it with the rest of the world who have not had it rammed into their ears already. Unfortunately I have a sad story to relate. 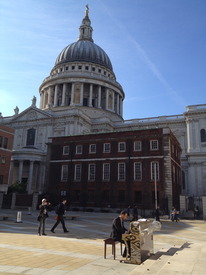 Today I was sat next to the Paternoster Square piano enjoying a quick burst of sunshine and the piano being played. The music grew from pleasant but hesitant tinkling of Cold Play to more assertive tunes when an older man took over the keyboard. Several young men began to accompany him by playing their collection of ukuleles and guitars as well as singing. They were great, the music was great. It was one of those memorable city moments. Alas, along came the Paternoster Square security guard to stop the fun. The group playing seemed to be gracious and left after a discussion between the piano man and security guard. I left too, sullen after a shining moment in London. 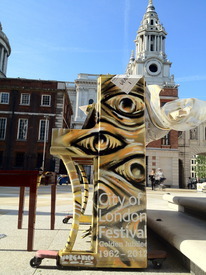 Location; Paternoster Square by St Paul's Cathedral. A quick set before sprinting for the Tube to Euston to make my connection back up North. Great end to a great day! Listening to a beautiful piano in the sunshine before work. Perfect! Just waiting to be played.. The bells of St Paul's were chiming so I started playing For Whom The Bell Tolls by Metallica with the hope of sychronising the intro with the chimes. Unfortunately the chiming stopped at the very second as I started playing. Only one "bong" was caught on the video. Location Paternoster square by St Paul's Cathedral, London.